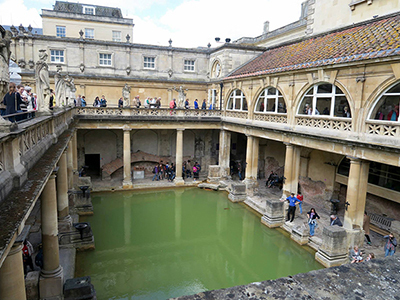 The Roman Baths is an historical site in the British city of Bath. Literary London, a summer study abroad program housed in the Department of English, will offer internships next year alongside courses on Jane Austen and William Shakespeare, according to program director and associate professor of English Kaara Peterson. Literary London brings students to study a selection of three literature and creative writing courses, usually offering residences in the affluent Marylebone district. Students earn 7 Miami credits in over 6 weeks, satisfying a range of Global Miami Plan, English major, and other requirements. The program will run in 2017 from May 23 through June 30. "We'll have an overnight trip in Bath, southwest of London, linked to the Austen course," said Peterson. "Next year is the 200th anniversary of Jane Austen's death, which means there’re all sorts of special events surrounding that. We're going to stay right in Queen's Square, take a trip to Winchester where she's buried, and visit her house in Chawton, which is a beautiful little countryside village." According to Peterson, the Austen course, ENG 281/440 - Jane Austen, the English Novel, and Popular Culture, is popular among students. It will be taught by associate professor Katherine Kickel. Students enrolled in the class will also visit a museum called the Jane Austen Centre, the historic Pulteney Bridge in Bath, and the famous Georgian-style townhouses known as the Royal Crescent. Another Literary London staple, ENG 134/440 - Shakespeare On-Stage, On-Site, will be taught by Peterson. 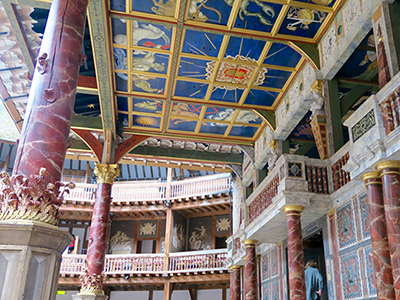 Students will have the opportunity to stay overnight in Shakespeare's own Stratford-upon-Avon, watch performances of Antigone and Cleopatra in the famous Globe Theatre, visit the newly reopened schoolhouse that Shakespeare attended, and cruise down the river Avon. In some years, students also visit a full-size replica of the Elizabethan pirate galleon The Golden Hinde, which was captained by famous explorer Sir Francis Drake. Peterson said that the third course will either be ENG 226 - London Writing you: Intro to Creative Writing taught by assistant professor TaraShea Nesbit or ENG 336 - Abolitionist London and the Fall of Slavery taught by associate professor Stefanie Dunning. The selection will be made based on student interest. Literary London will offer internships for the second year in a row. Last year, 13 of the 20 students involved in the program worked as interns alongside attending classes. Peterson expects the numbers to be higher this year. "The internships aren’t necessarily focused on literature," Peterson said. "For example, there is a Zoology major looking into working with animals, possibly at the London Zoo, and two students worked theater internships last year. The placements are quite varied." Deadlines to apply for the Literary London program are fast approaching. Those looking to apply for the internships must do so with a valid passport already in hand by Thursday, December 1. Students must then apply, with program course selections confirmed by February. Visit the Literary London website or email literarylondon@MiamiOH.edu for more information.